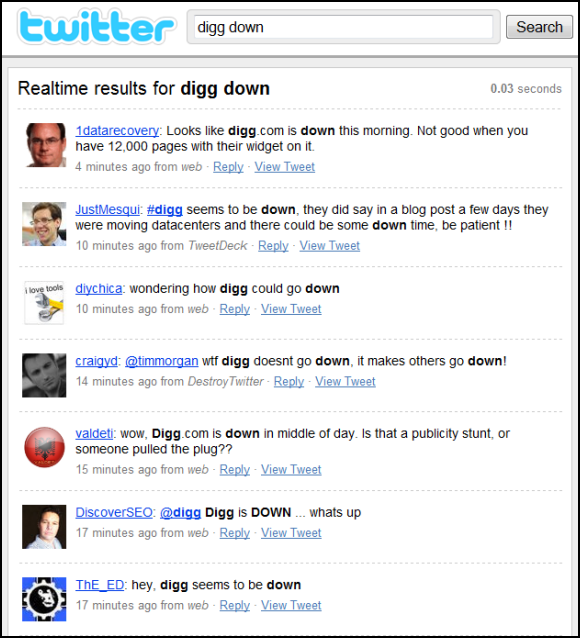 Digg had an outage today that was most likely the result of the ongoing migration of Digg’s servers to a new data center. This just goes to show how quickly such news are spread these days thanks to services like Twitter where conversations take place more or less in real time. An interesting note here is that a service like Digg has plenty of international users, meaning that no matter when they take the service down, it will be daytime somewhere. No matter when they do it, users will be affected. As we have pointed out before, there simply is no “in the middle of the night” on the Internet. Right now, we are in the final stages of this migration. During the next few weeks the remaining parts of Digg’s infrastructure will be moved to the new DC and we’ll turn out the lights in the old cage. Well, actually, they will stay on and belong to someone else in that DC that’s been eyeing our space for some time. My point in delving into this migration is to let Diggers know that there may be more glitches as we get closer to completing the move. So, you may try to go to Digg late some nights Pacific Daylight Savings Time and find us slow or not there. We’ll warn users before we start doing these moves with a message on the home page, but, if the site’s down and you weren’t there when we posted the message, then you might be troubled by our absence. Isn’t Digg large enough to justify multi-datacenters with mysql replication between them? I’d rather have several small DC’s installations than one big one begging to take down the entire service. I believe this is how Automattic (WordPress.com) does it. How’s their uptime record? @_ck_: Afaik, WordPress.com has servers in three different data centers. Their uptime record is very good. That of Digg, don’t know.